SURFCAM offers numerous standard features for ease of use and compatibility. All toolpaths are fully associative to the geometry used to generate them. Toolpaths can be regenerated after changing any cutting parameters without the need for re-selecting the geometry. Toolpath Editor Graphically edit any toolpath (pan, zoom, rotate during editing). Instantly move forward or backward through megabytes of toolpath without restarting at the top. Insert, edit, delete, or add machine commands or comments, change feeds or speeds anywhere in a toolpath by simply picking the point of insertion. Toolpath templates allow you to collect and reuse parameters for all toolpath types. Icon-based toolpath management system with simple cut and paste functions allows you to easily add standard machining procedures to your active part program, and re-order toolpaths using "drag and drop." Single keystroke toolpath regeneration or parameter changes without regenerating toolpaths. Extensive toolpath transformation facility supporting any combination of XYZ translate, rotate, mirror, scale, radial wrap, reverse, and merge steps with retention of all steps for regeneration. Associativity between geometry and toolpath is tracked by icon color. Automated toolpath commentary creates a high level outline of machining operations in the order they will be output. Template-based direct postprocessing for edit-free G code for most 2 – 4-Axis CNC milling, turning and 2-Axis wire EDM applications. Over 160 sample posts with every system. Configurable CLfile-based 5-Axis & MillTurn postprocessor provides full MillTurn, 4-Axis Wire EDM and 5-Axis contouring support for any machine/controller combination with full macro programming language for special effects. Single button file transfer via serial line. Multiple CNC machine attribute files containing start & stop codes, communications protocol settings, special character handling, upload and download directory/filenames. A user-configurable setup sheet generator provides cycle time, travel, tool lists, toolpath comment records, and all information needed for job setup in ASCII text or convenient HTML format. 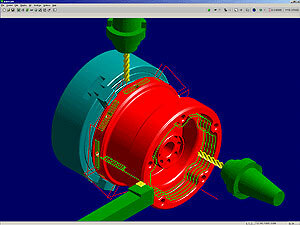 Integral cam, gear, and involute utilities quickly generate machineable geometry. Microsoft Access® database holds all geometric data for each tool and each defined material type. Shipped version contains over 500 tools and 50 material types in both inch and metric format. Tool feeds and speeds are automatically calculated from parameters that work with tool/material library to control stepover, side clearances, and rough/finish stock conditions to minimize user data input. Fanuc-compatible 2 or 3-Axis mill or lathe G code files can be converted into graphic toolpaths and subsequently edited or displayed on a 3D surface model, and subsequently postprocessed for a different machine. Windows®-based high performance editNC® text editor specifically designed to handle G Code supports editing of unlimited sized files; global edits, NC block resequencing, 3D back-plotting with zoom-pan-viewing and integral link to DNC utility. Consolidates surface toolpaths into arc records in XY, YZ, or ZX plane according to user-specified tolerance. Consolidates toolpaths into NURB format according to user-specified tolerance for postprocessors and CNCs that support this feature. Accurate and rapid material removal simulation. Dynamically rotate and zoom while simulation is running. Verification can be run in any of four modes: Regular for best dynamic rotate/zoom, True Solids for fastest 3D machining, Pixel-based for large 4/5 axis files, and Turbo for end results only. Custom stock and fixture shapes via STL Files, and stock and fixture library. Full clamp/fixture collision detection with warning sound and/or pause. Verification of custom tools including collision detection for non-cutting areas. Status window for live feedback with cycle time, tool parameters and cutter moves. Inspect locations, distances and arc radii/diameters of the verified solid model. Visualize sections with respect to any angle and distance of XY, YZ, ZX planes. Compare remaining stock with part model to detect remaining material based upon user specified tolerance values.